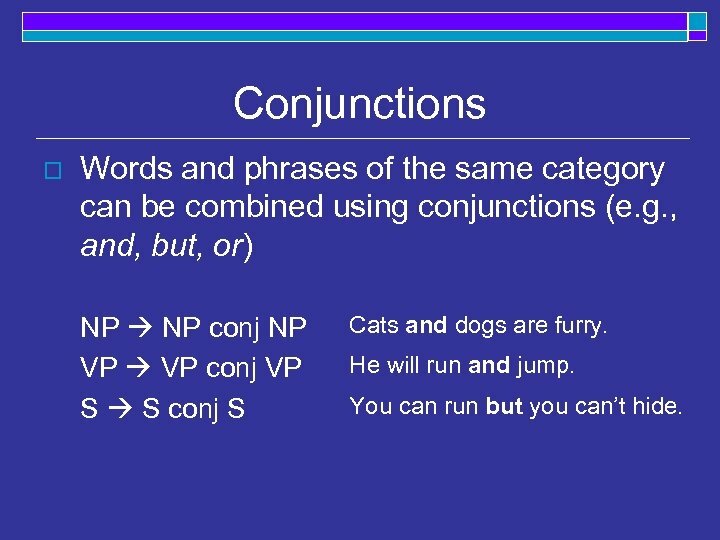 Conjunctions o Words and phrases of the same category can be combined using conjunctions (e. g. , and, but, or) NP conj NP VP conj VP S S conj S Cats and dogs are furry. He will run and jump. You can run but you can’t hide. 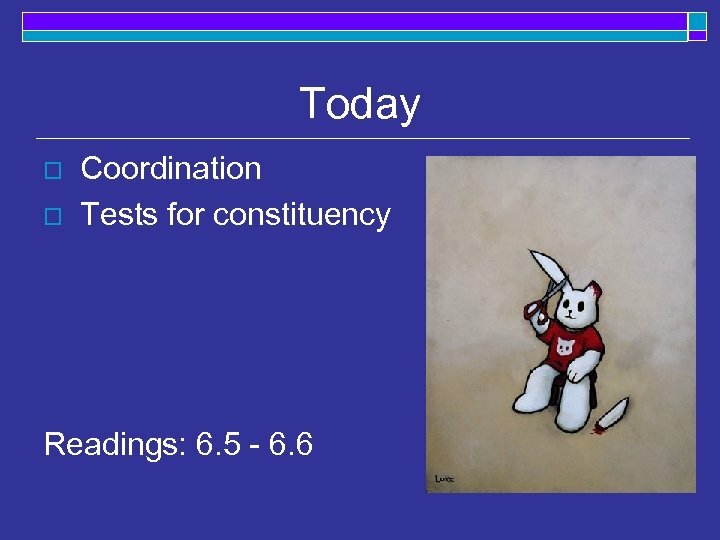 Coordination test o Reveals information about n whether a group of words is a constituent o o o n I [VP slept]. 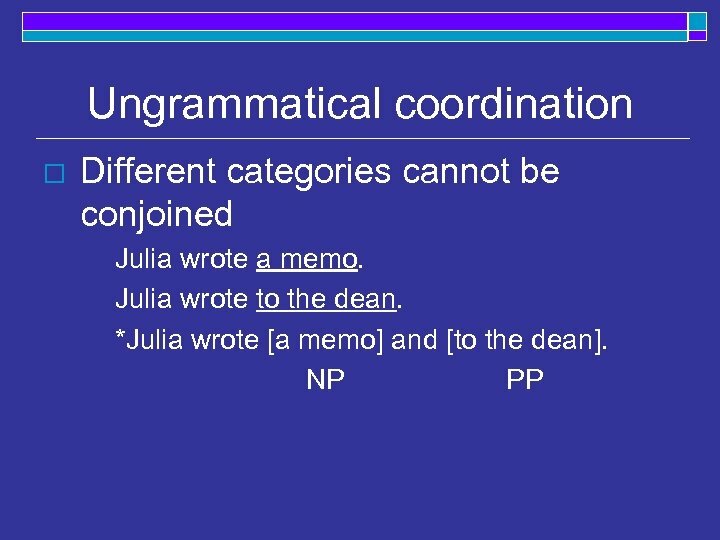 I [[slept] and [dreamed about Linguistics]]. 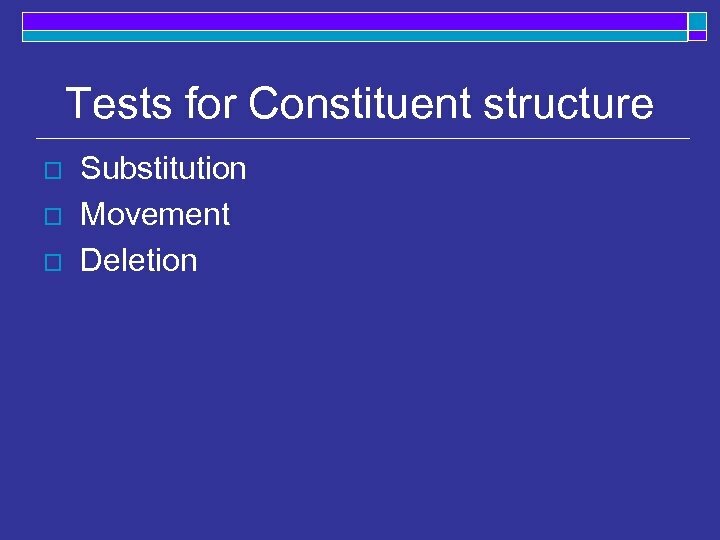 *I [slept and dreamed] about Linguistics. 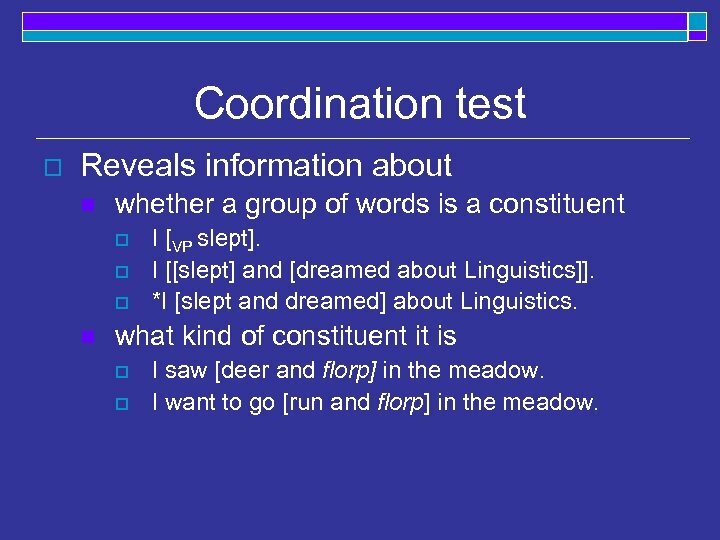 what kind of constituent it is o o I saw [deer and florp] in the meadow. 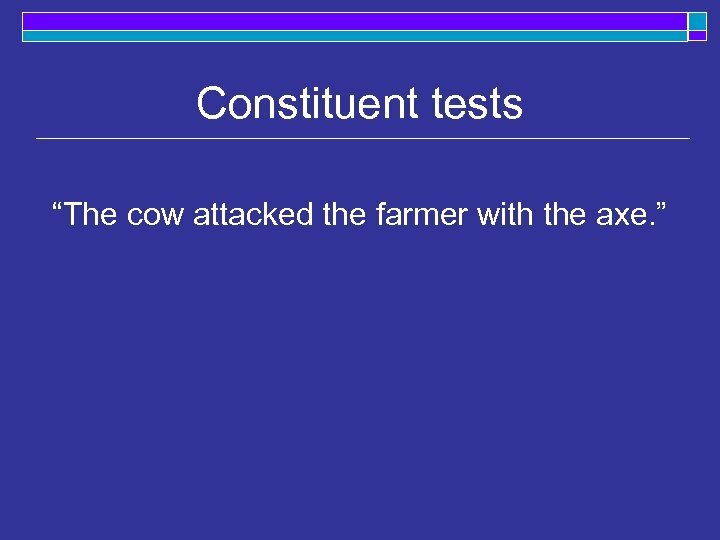 I want to go [run and florp] in the meadow. 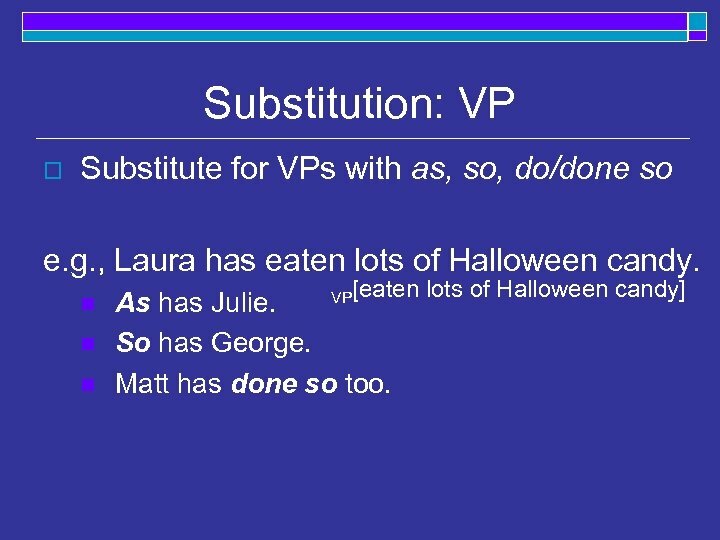 VP substitution and coordination o John will [VP [go to the linguistics lecture] and [learn about syntax]]. 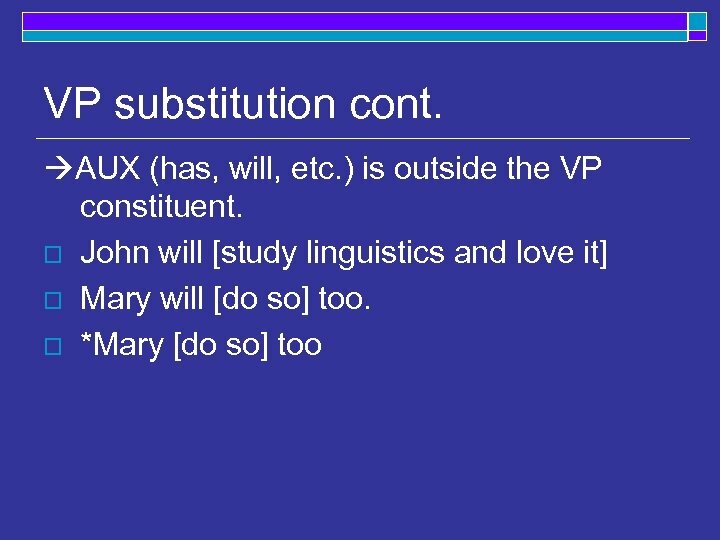 o Mary will [do so] too. 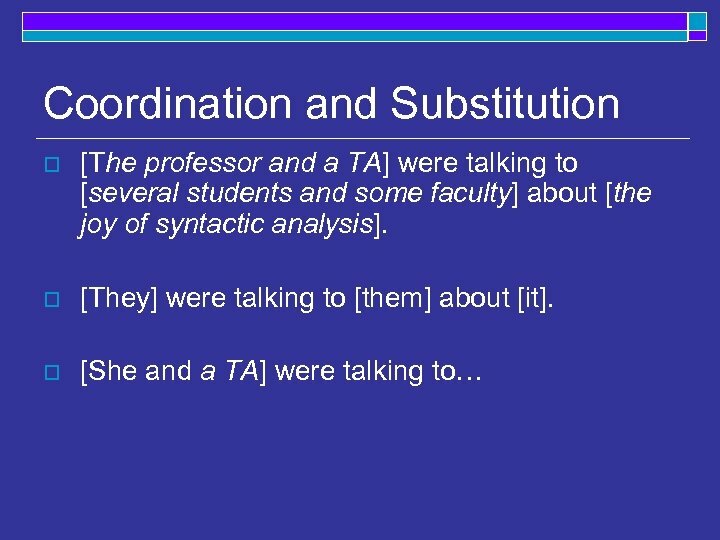 o Mary will [[go to the lecture] and [do so]] too. 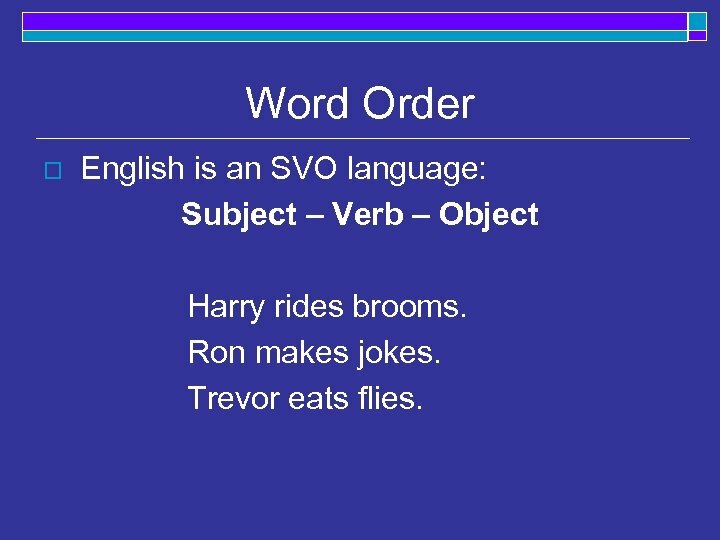 Word Order o English is an SVO language: Subject – Verb – Object Harry rides brooms. 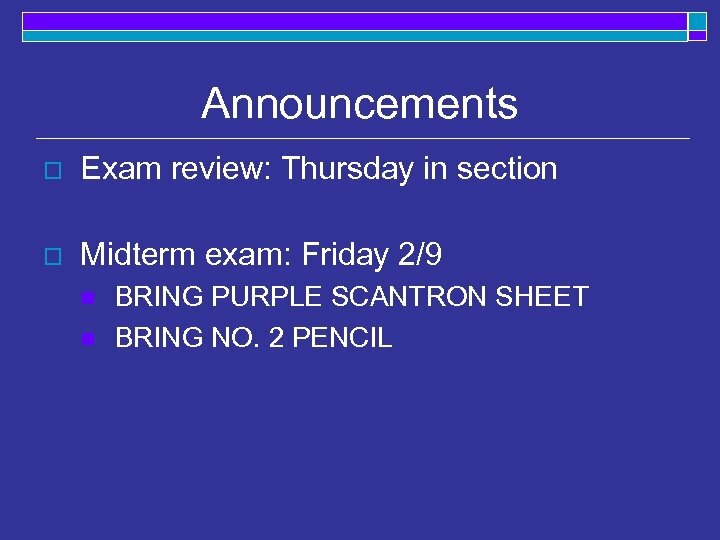 Ron makes jokes. Trevor eats flies. 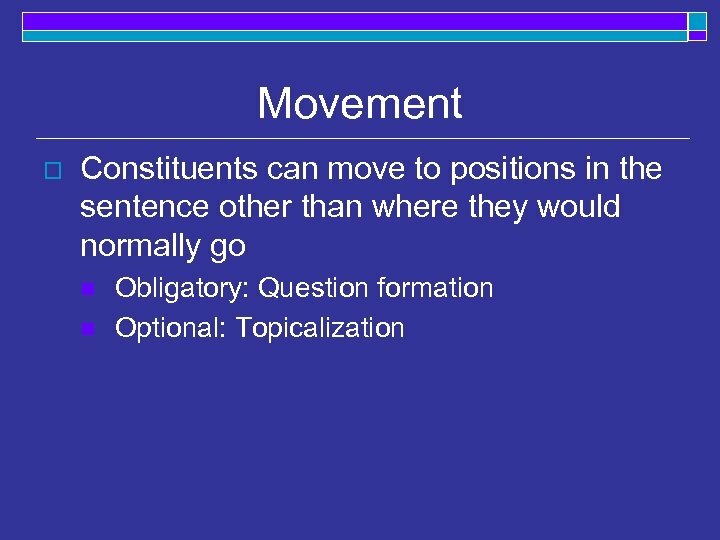 Obligatory Movement o Question formation: “Laura will drive her car on the weekend. 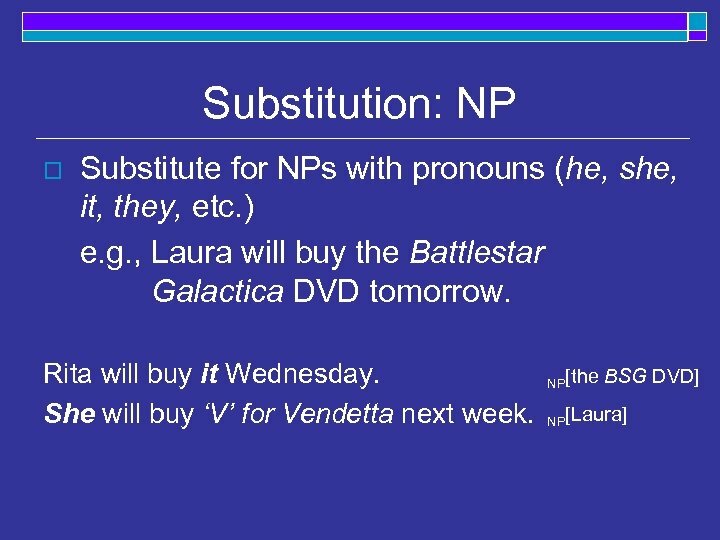 ” What will Laura drive (her car) on the weekend? When will Laura drive her car (on the weekend)? 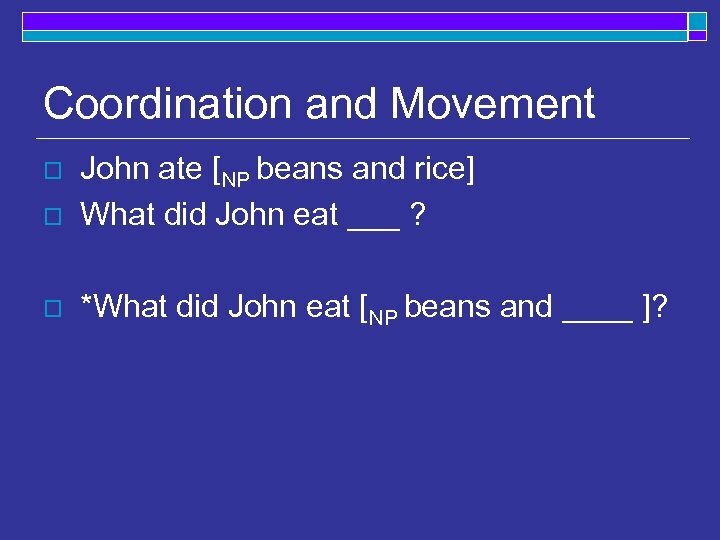 Optional Movement o Topicalization: optional movement used to emphasize something n I don’t like peas, but peanuts I like _____. 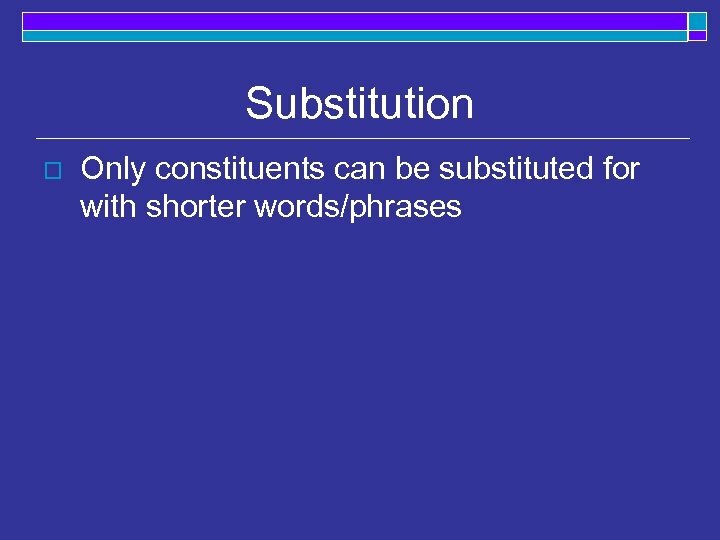 O-S-V n They didn’t think he could win the election, but win the election he did _____. 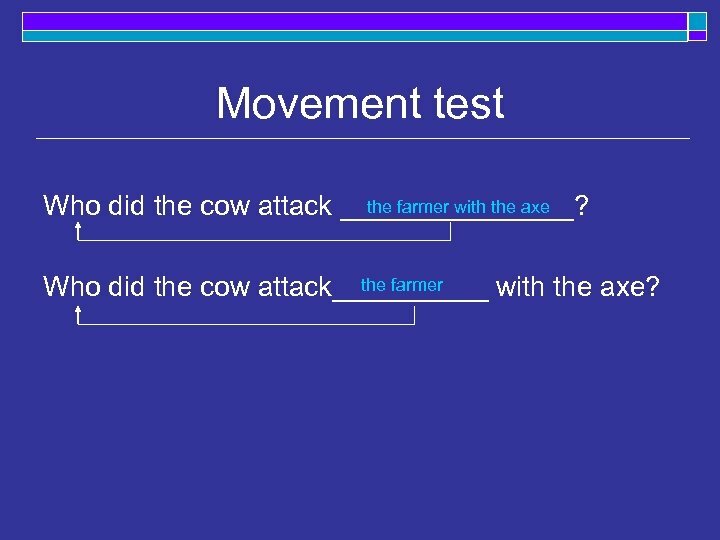 Movement test the farmer with the axe Who did the cow attack ________? 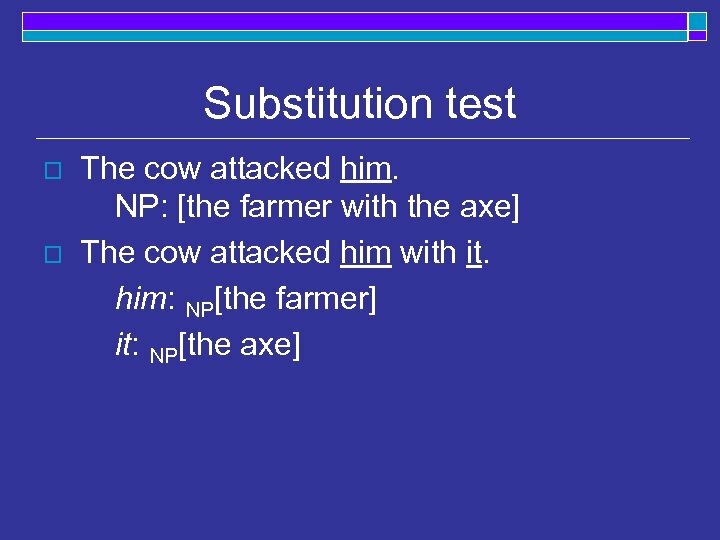 the farmer Who did the cow attack_____ with the axe? 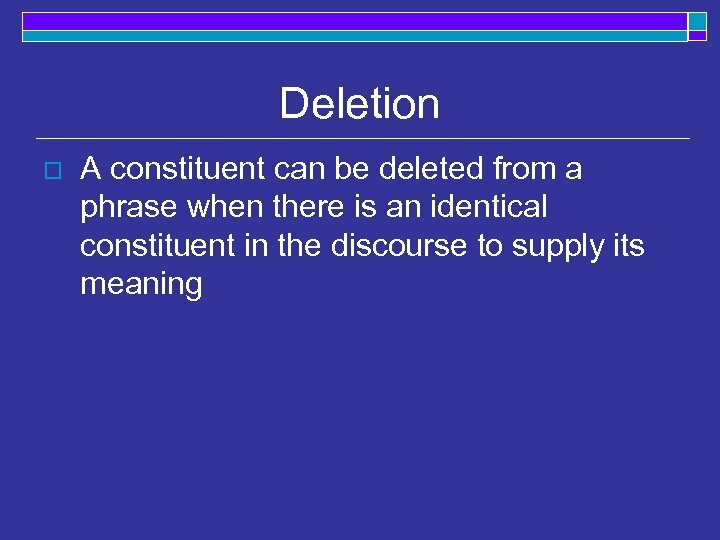 Deletion: VP o Imelda is going to [see The Nutcracker]. 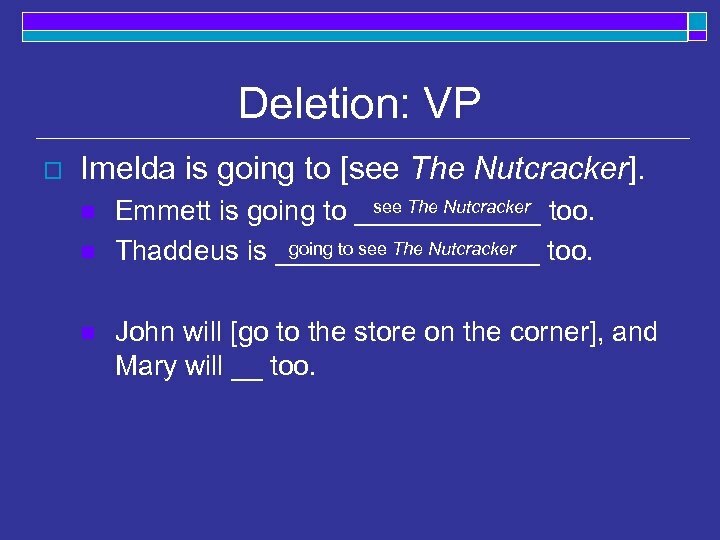 n n n see The Nutcracker Emmett is going to ______ too. going to see The Nutcracker Thaddeus is _________ too. 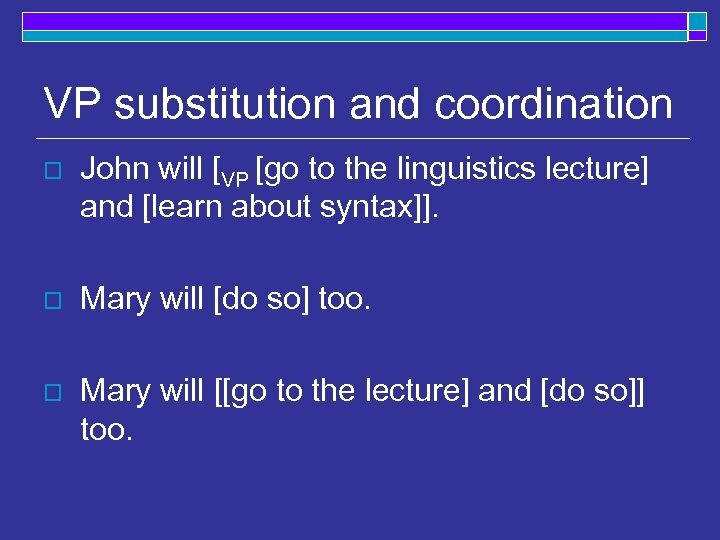 John will [go to the store on the corner], and Mary will __ too.